The official nature of this sign is to advise motorists that u-turns are not allowed at this location. However, in this location in front of the Peace Arch City Post Office where u-turns are prohibited this particular warning sign has been altered. 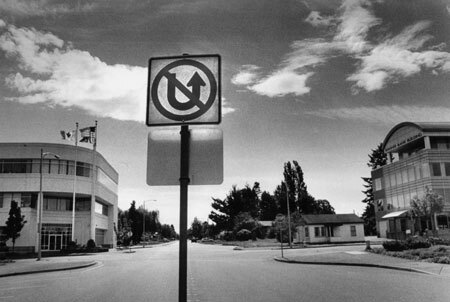 Someone with mischief in their hearts has climbed up and u-turned this no u-turn sign, upside down. To the official minded driver the meaning of the misdirected thought may be lost or at the very least unnoticed. On the other hand, there may be no prank intended but rather important subliminal messages are now being communicated to us. The sign could now be saying that there is to be no upward mobility at this designated spot. This could also be observed as a projection that our economy is still locked in a recession mode. Then again, the sign may suggest that we should not lift our spirits when we come to the post office because mostly junk mail and/or bills are waiting for us in the little locked steel boxes. Or, we must not let our personal attitude rise knowing it is a dangerous world we live in today. Or, it's a political omen that no matter who wins this presidential election things aren't getting better right away.